I was off in Wales for eight glorious days, admiring the gardens, touring the Roman ruins, staying with friends, watching sheep gamboling in their yard. Meanwhile my roof garden in New York City was dying a slow death. my garden would be safe from an oh-so-small watering snafu in July, but NO. all died, the leaves have turned yellow and are dropping off. The potentilla looks dead. (See Before picture of the Harison's yellow rose on the post of March 30, '09, see After, just above) Even the cone flowers look sick. The good news? Succulents not on the drip system are thriving, as are the plants in self-watering containers. 1.By hand with hose or watering can. But I have over 80 containers and watering each daily would take at least two hours. 2.Self-watering containers are fine for smaller plants, but still need regular filling during dry days. 3.Automatic drip irrigation works except when it doesn’t. 4.Natural rainfall. See # 3 above. Normally, drip irrigation is the most reliable, except when there’s a power failure, someone turns off the main switch or there’s a kink or cut in a line. I need a backup plan i.e an observant person who will notice the signs of water deficit disorder and solve the problem. Does such a person exist in my building? Hopefully some have just lost their leaves and will bounce back. I "hate" pots and planters for this reason alone. I cannot leave my vegetables for a week or else. Even the rain doesn't do it, the leaves shedding the water before ever getting into the soil. What a terrible way to come back from a trip. The horror! 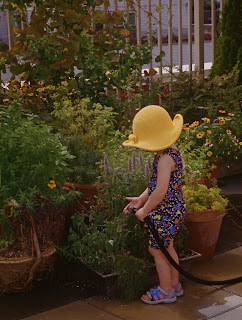 I'm tempted to say it was worth it to see that adorable picture of the granddaughter in the yellow chapeau. Except, of course, it isn't. Here's hoping for a full recovery. From Betsy in MA, this comment. "What a heart-breaker. I am so sorry. I hope everything will recover, now that Mom is home. I love the picture of the sheep." Well Mom turned on the water, also watered with a hose and some plants that had looked totally dead perked up. We'll see. Jen, Great offer, but since the whole roof surface will be replaced starting next week and everything will have to be moved, I'm waiting to replant til the construction is over.